Auto Europe specializes in European car rental, flights to Europe & hotels in major European cities. Auto Europe also offers chauffeur services & luxury car rentals. 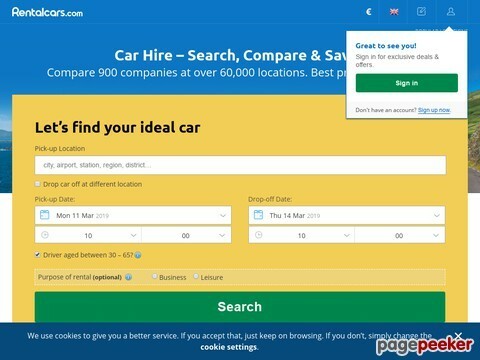 Guide to Reserve Rental Cars Directly With Great Rates... Over 50 Companies! Searching all the car rental providers to find you the best deal. Discounted car hire from over 4,000 locations worldwide from Car hire 3000. Book car hire with no cancellation or amendment fees and worldwide free phone support. Pay less, get more. Renault Euro drive offers short-term car rental or lease programs for new cars, with agencies located throughout Europe. Call (888) 532 1221 and choose a brand new car from our extensive Renault fleet. Online car rental company offering rental cars in various pick-up locations in the world. Offers several language versions and prices in different currencies. Find the cheapest car rental deals in the United States with Vroom's two step search!